Keeping oneself safe is the most important point for any individual doing road construction, there are many aspects under safe, being visible to vehicles is from the most important - though anything can happen, for one vehicles can be passing the entire day, therefore safety vests are a must and selecting a durble highly reflective apparel is a top priority. 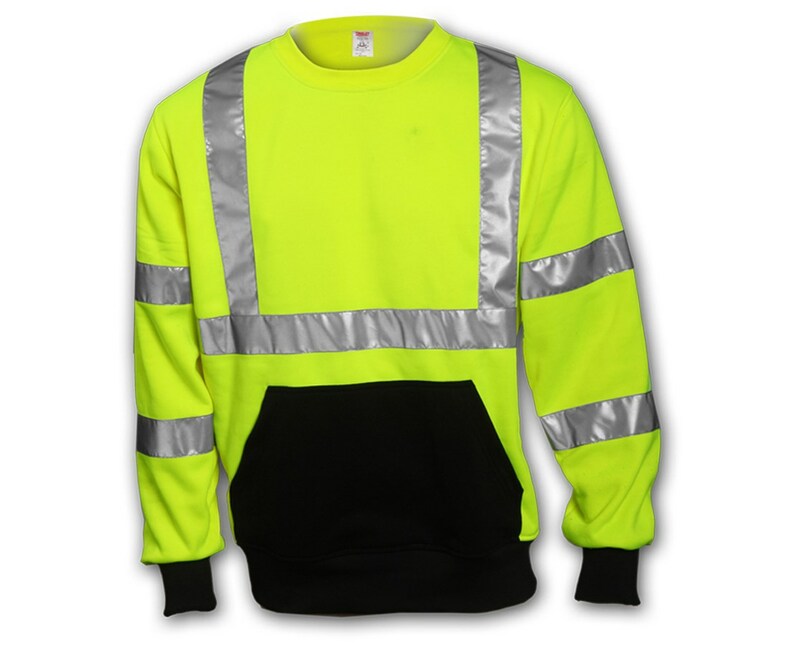 This Class 3 Crew Neck High Visibility Sweat-shirt is a comfortable roomy sweat-shirt that will keep you visible in your work zone. Composed of high density 100% polyester providing excellent warmth in cooler temperatures, it’s designed with an excellent cut and material that stretches which allows you to move freely while you work. A fluorescent yellow - green outer shell with a 2” silver reflective tape along with its ANSI 107 class 3 rating of high visibility provides reflective light for 360° nighttime conspicuity and will help you be distinguished in time of danger or to vehicles when working on the road during daytime and nighttime. Includes 1 front pouch pocket, black elasticized polyester knit sleeve cuffs, black elasticized polyester knit waist band, as well as a front that is black on bottom half which helps conceal dirt. 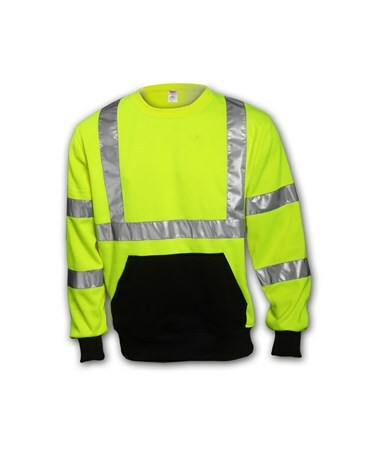 With that said if you're looking for a comfortable high visibility safety sweat-shirt which will allow you to work at ease and is also excellent for cooler temperatures while providing visibility, then this is an excellent option. Includes 1 front pouch pocket.